We love our fans! After reading a recent comment from Karen on where to get good pizza in the city, both Mom and I were in the mood to have some. Karen suggested Minerva's III, which was a frequent favorite of my former co-workers when I was employed just a block away. I had never ordered anything from there personally, but I saw many a happy face ooh and ahh over their delicious-looking lunches in the break room. Now I knew that Minerva's delivered, but I wasn't sure if we were too far out of their area. Alas, we were, so I had to pick up the pies. Because we didn't have a menu, we just went with our gut and ordered a large linguica and a large extra cheese. I placed the order with a polite gentleman at 6:45 p.m., and was told that the pies would be ready in 15 minutes. 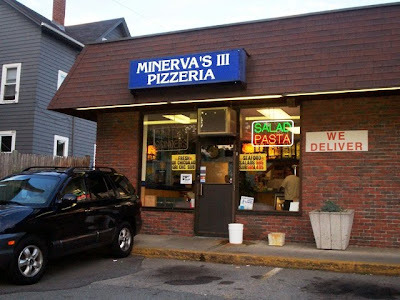 Knowing that the on-ramp to Route 79 was just down the street, I patiently waited for a whole nine minutes before taking the six minute ride to Minerva's III, courtesy of the Brightman Street off-ramp. I arrived at 7 p.m.
Minerva's III is located inside of a small neighborhood plaza. Unfortunately, due to the place being quite busy, I was unable to get a photo of the interior. However, it is pretty much what you'd expect from a tiny pizza parlor - booths on each side of the restaurant, a TV perched in one of the corners, and a large ordering window for customers in the center. That's about it! Small and clean - you really can't ask for anything else. No wonder the local crowd is always happy to be there! As I was waiting for my change, I grabbed a take-out menu from the stack on the counter. When the young man handed me the pizzas, I started to leave but soon realized that I could not open the door with two pizza boxes in my hand. Luckily, an older gentleman wearing a Minerva's shirt came to my rescue and opened the door for me. He also walked me to my car, parked right outside in the plaza parking lot, and chatted with me for a few minutes because he thought our SUVs looked similar. After some local kids on bikes came by to give the popular man a hug, I took the highway back home with the aroma of hot pizzas filling up my Kia. I was in heaven! We called for Dad, who was watching TV in the other room, and dinner had begun. We tried the cheese pizza first. 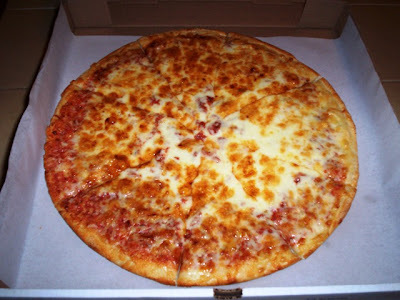 Now we always say that the best thing to do when trying a new pizza place is to order a plain cheese. If they can master some dough with sauce and cheese on it, they can pretty much do anything. Well, this pizza was a LOT better than we expected. We knew that it looked good, and smelled good, but the taste was outstanding. This was definitely homemade. The crust was sturdy and crisp, yet deliciously chewy inside. The sauce had a slightly sweet taste, while the cheese was real. There's nothing Dad hates worse on a pizza than "fake" cheese (i.e., the stringy stuff on crappy chain pizzas), but this cheese was fresh and melted beautifully over the pie. We had ordered an extra cheese, and they were very generous with this extra topping. The pizza cut perfectly and was gone in a flash. It even reheated well when I had some the next day. That almost never happens! 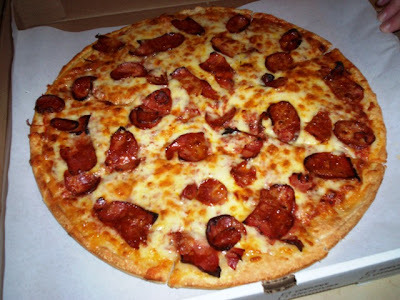 The linguica pizza had all the attributes of the cheese, but was topped with thin slices of the Portuguese sausage. Because the pieces of meat were sliced thin, they had a slight crisp to them. The taste of the linguica also gave the cheese an extra spicy kick. This was another excellent pie that we would order again in a heartbeat. Even Dad was pleased, and he's been quite fussy these days. Minerva's III has a great menu with prices to match. Pizzas range from $4.95-13.95, and include gourmet flavors such as Greek, meatlovers, steak arrabbiata, and chicken Florentine. There is also a light pizza made with vegetables and low-fat cheese. If you're feeling really hungry, or want to be the most popular person in your office, pick up a 20" monster pizza for $13.95 ($3.50 for each topping and $5 for extra cheese). Grinders range from $4.50-6.75 and include eggplant parmesan, Italian, pepper and egg, chourico and chip, Willow Tree chicken salad, buffalo chicken, and gyro. You can also have a gyro plate for $6.50 that comes with fries and salad. Appetizers include onion rings ($2.50), fries ($2), mozzarella sticks ($4.95), and a jumbo combo featuring chicken fingers, wings, mozzarella sticks, and fries served with your choice of sauce for $6.75. Pasta plates include chourico ($6.25), eggplant ($6.25), meatballs and sausage ($7.25), and chicken ($6.25). Salads include Greek ($5.50), buffalo chicken ($5.95), grilled chicken and feta ($6.95), and antipasto ($5.95). You also also order a freshly baked calzone for the same price as a small pizza with your choice of topping. Credit cards are accepted at Minerva's III. There are Minerva's Pizzeria's all over this area. 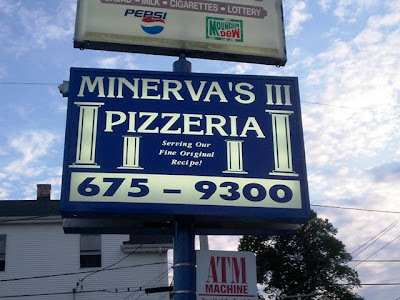 We've found a Minerva's II in Somerset, which is bar and grill, but we still don't know where the original Minerva's is. Oh well, we're very, very happy with number three, and we look forward to many more visits to this popular pizza place. Thanks for the suggestion, Karen. Keep 'em coming! Minerva's II Pizzeria is open from 10 a.m. to 10 p.m. daily.